Today’s Daily Prompt Challenge was to talk about your junk food weakness. 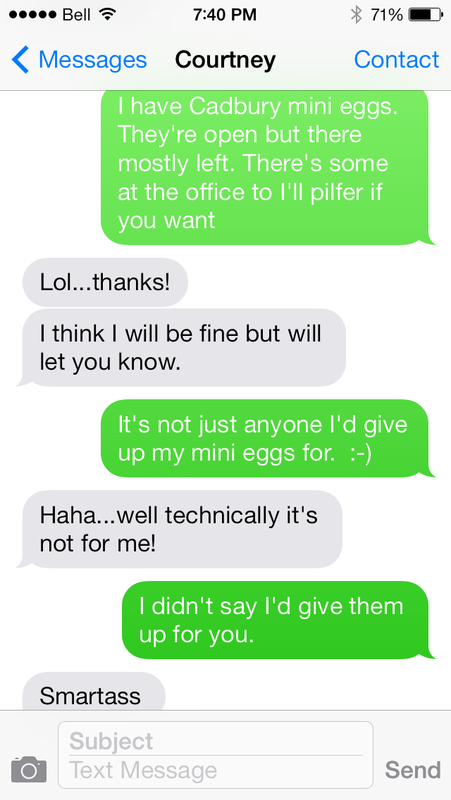 This time of year, mine is definitely Cadbury Cream Eggs, specifically the mini version. I find the chocolate to cream ratio much more pleasing that the larger version. The larger version is also much messier, as witnessed by the number of times I’ve had the cream centre dripping on me. (I confess to licking during the clean-up; I have no shame). It’s also easier to rationalize eating more than one (they’re just mini after all). The fact that I have this many reasons on hand of why I prefer the mini version is a little (a lot) frightening for me. This is the first Daily Prompt Challenge I’ve participated in. Earlier this evening I actually had a text conversation with my sister about mini Cadbury eggs for my nieces and nephew for Easter, so when I saw the prompt it seemed fitting.